"You were great - the best review - 'I can't believe what an incredible ventriloquist she is!' Thanks so much for performing (or is it just being you!) at our breakfast." Button isn't just the best at what she does, she's the only one who does what she does. "Button, thanks a million for making our picnic a special memory for a lot of kids and adults." 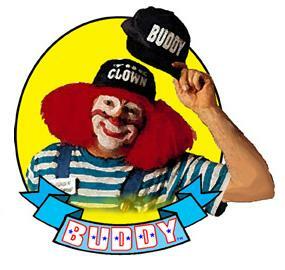 A Full-Time Professional Clown since 1985. Button has skills that took over 20 years of training to acquire. 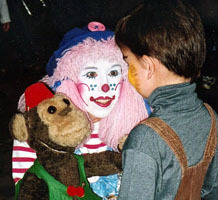 She trained and taught at both clown and variety arts schools in the U.S.A. and recently attended the Ventriloquist Convention in Fort Mitchell Kentucky. Stampede breakfasts, corporate events, and Christmas parties. 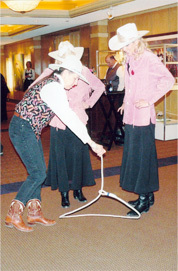 "The content of this show kept all the children's attention and everyone, adults included, thoroughly enjoyed the show." - Digital Equipment of Canada Ltd. Performed 8 years in a row on stage at the Calgary Stampede. 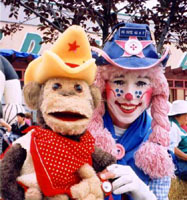 as well as Western Shows as Button the Broncette. Now available as a Trick Roper! "Button, your clown show was excellent. The laughter rang through the whole gym." 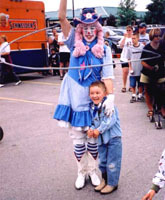 Her amazing ventriloquist act even brought the adults out of the beer gardens." 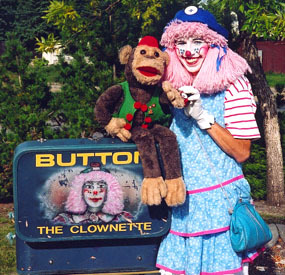 "Dear Button the Clown, I wanted to thank you for coming to my Birthday Party. It was truly magical to have you there. You were so wonderful and truly did an amazing job of making each of my friends feel special. My grandma is still wondering how you did those magic tricks -- she just doesn't get it's magic! All my friends and their parents really enjoyed your show. Thank you so much... you have my vote as clown of the year :) Thank you."